Tobacco Absolute Cuban Cigar﻿. 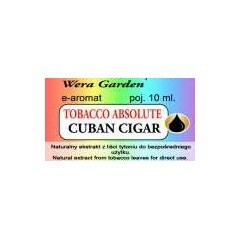 Liquid Tobacco absolute extract. Adds special analog cigarette ashtray taste to your e-liquid and some throathit. Mixed with tobacco aroma strengthens its taste. Add 10-15 drops per 10 ml.